Calcium is an important micronutrient that is essential for many functions in the body, but probably best known for its role in making and repairing bone. In childhood and teenage years, bones grow and repair very quickly, stopping growing in length at around 16-18 years of age but continuing to increase in density until the late 20s. 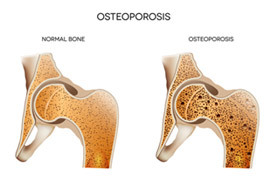 From about age 30-35, bone density gradually decreases - for most a normal part of the aging process. When bone density depletes too quickly, or prematurely, it can lead to problems with weak bones and possible osteoporosis. Getting enough calcium in the diet is vital throughout life - in childhood to build bone mass, and in adulthood to maintain strong bones. Weight bearing exercise (e.g. running, walking, tennis, gymnastics) is also vital as this helps to lock the calcium into the bone, and to improve strength. How do we use calcium? Calcium may also play a role in lowering blood pressure but there is as yet not enough evidence to prove this. Treatment of osteoporosis may include medication but the course of action will depend on how great your fracture risk is, and your age. Having a healthy diet, regular exercise and giving up smoking or heavy drinking, if this applies, will all help to reduce fracture risk. Healthy adults need around 700mg of calcium per day. Eating three portions of dairy foods each day should provide sufficient calcium however choosing foods from other food groups can provide good sources too. Individuals who have been diagnosed with weak bones, or osteoporosis, may be advised to increase calcium intake to 1000mg per day. An additional serving of low fat dairy, or other calcium fortified food, should be added to the diet. Calcium supplements may be recommended by a healthcare professional in addition to increasing calcium through the diet. Low fat dairy foods (e.g. skimmed milk, fat free yogurt) contain as much calcium (often slightly more) as full fat versions so calcium rich dairy foods can continue to be included even on a reduced fat or reduced calorie diet. Having too much calcium, usually through supplements, can result in stomach pains and diarrhoea so it's important to only supplement the calcium gained through diet, when dietary sources are inadequate or you are recommended to take a supplement by a healthcare professional. Calcium is vitally important for strong bones but other nutrients are also required to ensure the calcium is used properly by the body. Vitamin D is essential to import the calcium into the bone tissue. Vitamin D is mostly made within the body by the action of sunlight on the skin, and you should aim for short bursts of exposure to sunlight on the skin (without sunscreen) twice a day for around 10 minutes during the summer months. This should provide enough Vitamin D to last throughout the winter months. In addition good dietary sources of vitamin D include oily fish and fortified breakfast cereals. How can I add more calcium to my diet? Eating a healthy and balanced diet including at least 3 portions (4-5 portions if you have osteoporosis) of dairy foods should mean that you are getting enough calcium in your diet. Boosting calcium on a calorie reduced diet isn't impossible - just try to plan ahead and choose low fat, or fat free, versions of your favourite foods to get the optimum level.